When you click on Create Report, you are presented with the 3 major options for your report. This can be selected as Download or Email. If 'Download' is selected then the report can be downloaded from the Transaction Center when ready. If 'Email' is selected, a box will appear that asks for an email address. The report will be sent to the address specified when ready. Please note that only one format per report can be selected. You would need to create the report again if you need it in a different format. The report type determines what kinds of transactions to look for. Depending on the option you choose here, you will have some items to fill out specific to the report type and other items that are related to transaction details. Depending on the frequency, it will ask you to designate the end of the day/week/month/year. This will create a report for the last complete calendar year. 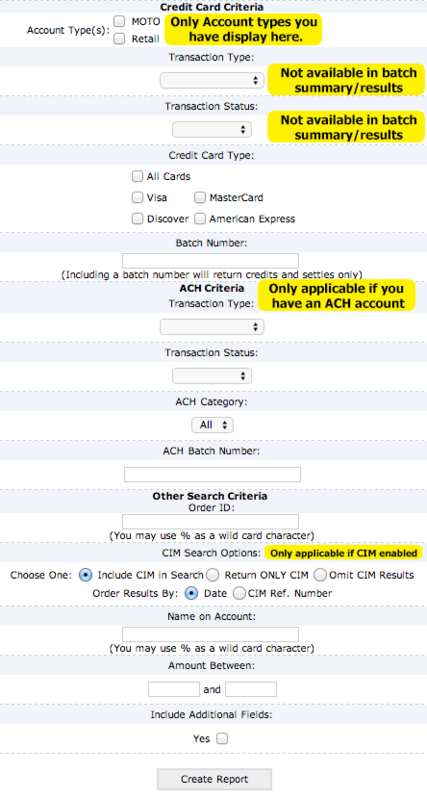 The Transaction Center will specify which dates the report will be applicable for. You will be asked to choose which month in which year to run the report for. The options displayed will only be for the last 6 months (if there are months prior with transactions). You will be asked to select a start date and end date. Scheduling options as explained above need to be set for this report. The status is simply deciding between what has already been run and what has not been run yet. The recurring type is the same as what would be set for the transactions themselves. This report is automatic. Selecting this eliminates all other options. As long as a timeframe is specified, you may leave all the other fields blank and the report will try to pull the information from all transactions. However, it is recommended that you try to be as specific as possible. If you have created a report that is not running on a schedule for download, it will be available here with a link to download. Clicking Edit will allow you to change report parameters. There is not currently a way to view older versions of the same scheduled report.